Last week, I kicked off a discussion on bet optimization by imploring punters to keep detailed records — or even not-so-detailed records (anything is better than nothing) — of their play. The idea being that a person could later use those records to formulate a wagering strategy or, as I like to call it, a “betting blueprint,” to maximize their profits at the windows. Today, I’m going to delve into one of those plans… the Kelly Criterion. Thus, if one typically wins 40 percent of his/her wagers at average winning odds of 2-1, the amount bet to optimize profits would be approximately 10 percent of capital (0.4 - 0.6 / 2 = 10 percent). If the aforementioned performance statistics hold true and we assume that there is no fluctuation in the winning price (which is highly unlikely but not important for the purpose of this illustration), a $500 starting bankroll would grow to approximately $1,300 after a series of 100 bets. OK, so far, so good. But what happens if one’s initial assumptions turn out to be wrong? Say, for example, that one mistakenly believed he/she could maintain a 50 percent winning average rather than the 40 percent mark that was actually achieved? Sadly, the outlook is about as rosy as an Evanescence song. Because a player would now be risking 25 percent of his/her capital (0.5 - 0.5 / 2 = 25 percent) per play instead of 10 percent, the initial $500 would stand at just $175 after the identical series of 100 bets. Get the point? In both cases, the ROI was a very healthy 20 percent per wager, yet when one assumes greater competence than he/she actually possesses, even a positive return can be turned negative — hence, the need for thorough and accurate records. Remember, how you bet is paramount to how you will ultimately fare in any form of speculation. I doubt there is a veteran sports gambler alive that can't remember at least one day when their selections were spot-on and yet they lost money. 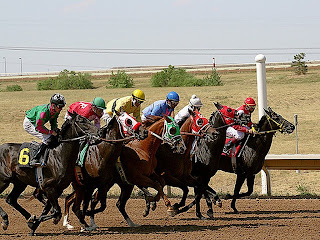 Whether it was the result of betting too much on a single event or by risking the majority of their day's bankroll on parlays or other forms of exotic wagering. Betting properly is hard… betting for value is even harder, and it requires tremendous discipline. 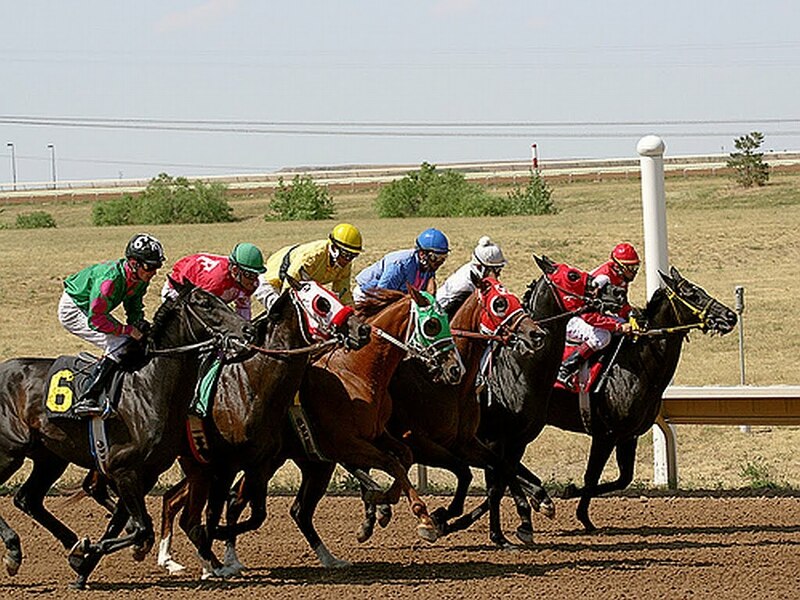 If you're like me, you're as much a fan of the sport(s) you're betting as you are a gambler and sometimes it's difficult to keep one's love of a team or participant from intruding on the principles of sound wagering. In an old podcast I did prior to the 2004 Belmont Stakes, I advised all my listeners to bet against Smarty Jones because I knew he would be bet well below his fair odds (which I had tabbed at 1-1). I offered my second choice Purge (at fair odds of 11-1) and my third choice Birdstone (at fair odds of 16-1) as the best alternatives. Yet, while I followed my own advice to some degree by betting both of those longshots to win, all of my pick-3 and pick-6 tickets singled “Smarty” because I so badly wanted to see a Triple Crown winner. As a result, what should have been a huge day at the windows became a day better spent shooting myself in the groin with a nail gun. Still, these are mistakes that most all of us will make from time to time, and they are the kind of errors that simply must be kept in check if one is to have any hope of triumphing over the pari-mutuel machine. Now, it doesn’t take a numbers whiz to see that San Pail was the best horse in this race. 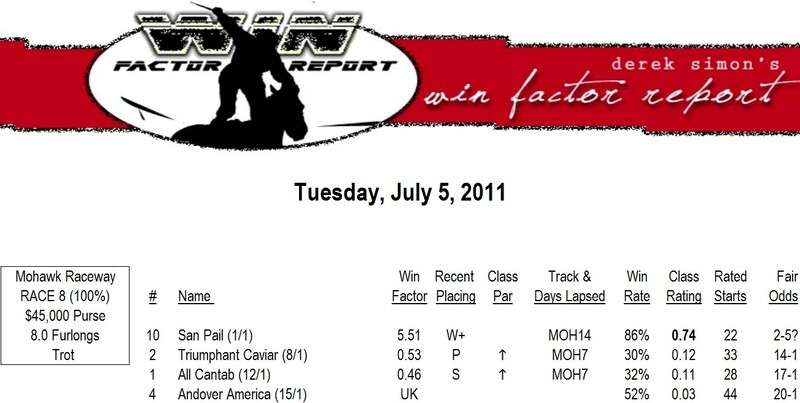 To begin with, Win Factor ratings above 1.00 are exceedingly rare, while ratings over 5.00 are practically unheard of. What’s more, San Pail had the best Class Rating in the field, an 86 percent Win Rate, great current form… in short, he looked like the proverbial “lock.” And, ironically, the seven-year-old gelding was offering a square price too, going to post at 45 cents on the dollar — right at his fair odds. You’ll notice that the 10-9 exacta wager was actually a severe underlay based on my Win Factor line, while both the 10-1 and 10-2 combos were offering outstanding prices. Hence, my bets were essentially made for me and I was a happy camper a few minutes later when Triumphant Cavier (#2) caught Define The World in deep stretch to complete a $24 exacta. Sometimes the game is easy. Coming soon… although not to a theatre near you.